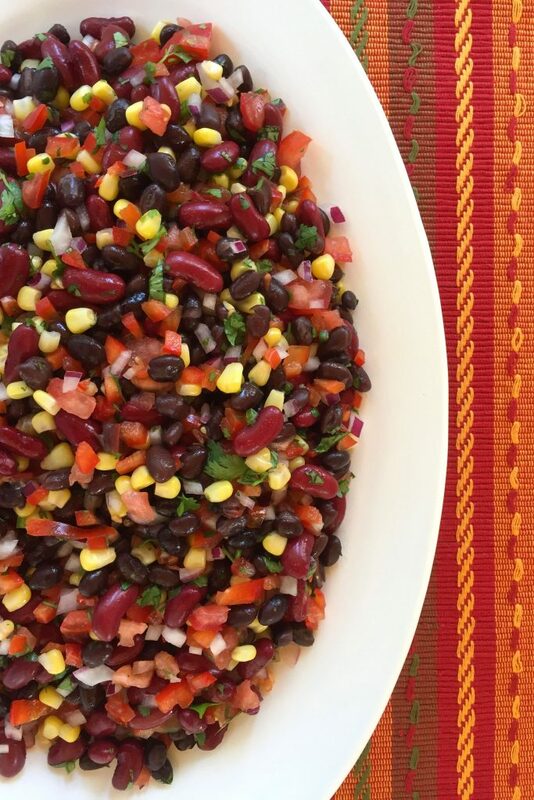 If you like salsa then I can assure you that you will LOVE Cowboy Caviar. First off, look at all the pretty colors going on. Gorgeous right? You know how they say, “you eat with your eyes first”. Well I can attest that this salsa tastes as good as it looks. It’s actually quite addicting once you start eating it. And for extra bonus points, Cowboy Caviar is incredibly healthy. It is so darn good for you, that you do not have to feel the least bit guilty eating it. So dig in and party on! 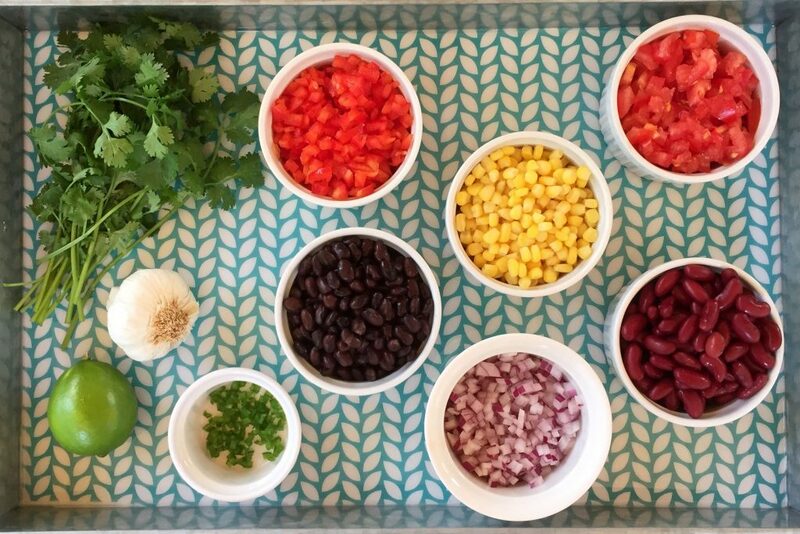 Here is my recipe for Cowboy Caviar which is basically a salsa with a lot more going on. Feel free to play around with it a bit. Use different beans if you want to, or add in or subtract out different vegetables. There definitely is some chopping involved but not as much as you think. It took me about 20 minutes to put together and I’m sure others out there could do it faster. Try and make it ahead of time so that the flavors have time to develop. Of course the classic way to serve Cowboy Caviar is with tortilla chips. Perfect party food. I also like to serve this with just about anything off the grill. Tonight (since I made so much of it), I am going to serve it with some rice and grilled chicken. Kind of a “Rice Bowl” thingy. The Cowboy Caviar will season the rice perfectly. Tomorrow night, I’m thinking of using it to top cheese quesadillas. Easy breezy dinners ahead! 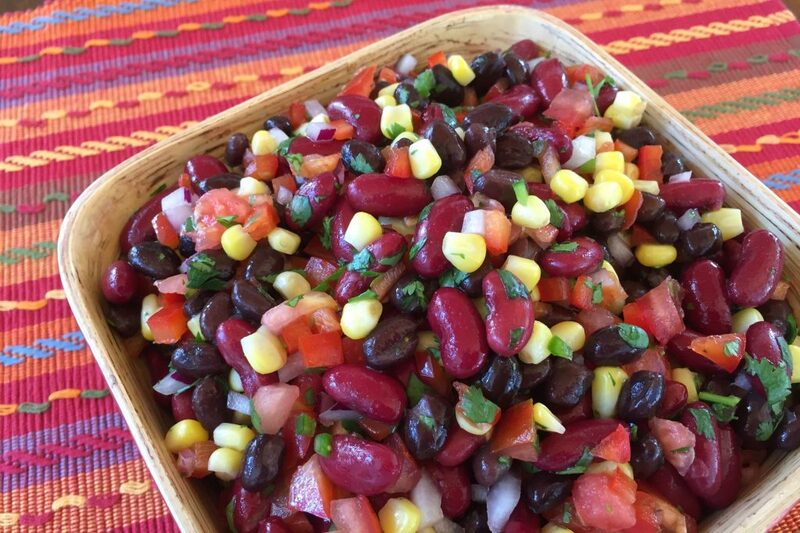 In a large bowl add in the black beans, red kidney beans, corn, tomatoes, the bell pepper and the minced red onion. Cut the jalapeno pepper in half lengthwise and scrape out the seeds. Cut each half of the pepper into thin strips and then again cross wise so the jalapeno is finely minced. *Everyone has a different idea of what spicy is, so add as much as the jalapeno pepper as you want. Add a second one in if you like things really spicy. Use plastic gloves when cutting hot peppers. If you do not, wash your hands with soap immediately afterward, being careful not to put you hands near your eyes. It will burn! Cut off the leaves off the cilantro (a few tender stems is fine). Chop up the cilantro until you have about 1/4 cups worth and add to the salsa. Gently mix all the ingredients together and set aside. Make the dressing as directed below. Pour over the salsa and gently toss together. Taste and add more salt or pepper if needed keeping in mind the flavors will develop as it sits. Refrigerate covered if not serving within the next hour. Whisk together the lime juice, the red wine vinegar, the olive oil, the garlic cloves, the chili powder, the ground cumin, the kosher salt and a few grinds of black pepper. 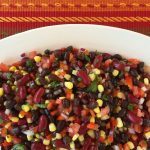 Feel free to substitute the red kidney beans with black-eyed peas, chick peas or another favorite bean. You could add in diced avocado right before serving for a nice touch. If you are using table salt instead of the kosher salt, use about half the amount and then taste to see if it needs more.